According to the OSHA website, “OSHA requires the use of personal protective equipment (PPE) to reduce employee exposure to hazards when engineering and administrative controls are not feasible or effective in reducing these exposures to acceptable levels.” The term personal protective equipment (PPE) refers to a wide range of devices and garments, including face shields, hard hats, specialized footwear, safety goggles and glasses, coveralls and respirators – among many other items. PPE is designed to protect employees from serious workplace injuries or illnesses that may be incurred from the hazards that arise in the natural course of their work – be those physical, chemical, electrical or other hazards. To OSHA, PPE is recognized as the final defense against workplace hazards, established after an organization has exhausted its other capabilities to reduce the potential for hazards – including engineering and administrative controls and work practices. Engineering controls involve physically altering a piece of equipment or machinery or the workplace environment in order to reduce the potential job hazards, and administrative controls involve altering the performance of the jobs, including schedules and the rotation of shifts to reduce exposure to hazards. 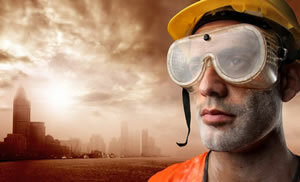 Work practices involve ensuring that employees have been adequately trained in hazard avoidance and exposure reduction. Employers are responsible for analyzing all job tasks for the requirement of PPE, and develop an appropriate PPE program for all concerned employees. A workplace PPE program should address any potential job hazards and detail the appropriate PPE that should be used for hazardous job tasks. As well, procedures for the selection, maintenance and use of any PPE should be established. Thorough employee training on the use and maintenance of PPE should be given, addressing a range of topics including how and when to use, wear and maintain the PPE, the appropriate types of PPE, and the limitations of protection offered by the PPE. Personal protective equipment can save lives, reduce illness and injury, and provide employees with a line of defense against workplace hazards. PPE is the law and it is the employee’s undeniable right – all workplaces should ensure that their employees are adequately protected, or suffer the financial and legal consequences.